From kids to the young at heart, everyone loves to eat burger. 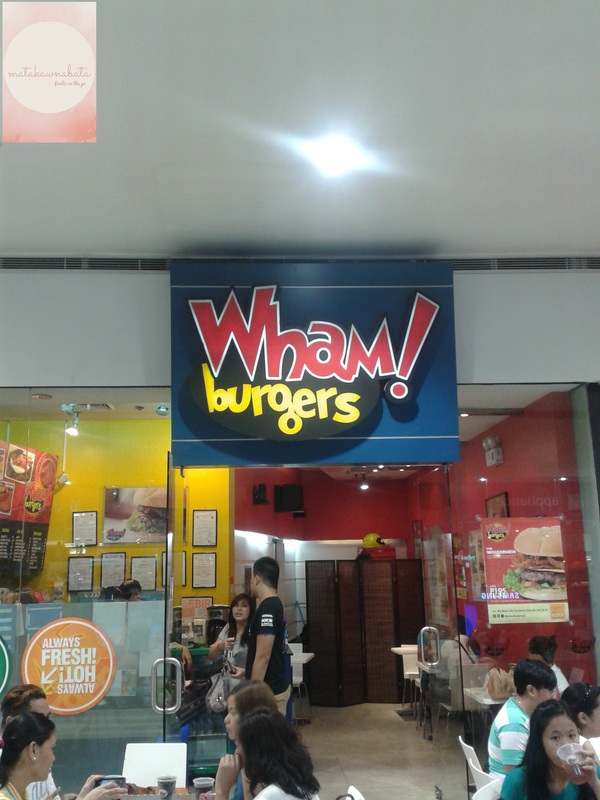 As we celebrate the National Burger’s Month, Wham! Burger is making everyone’s next burger lunch out extra-special with finger-friendly, crisp and addictingly good french fries for free. 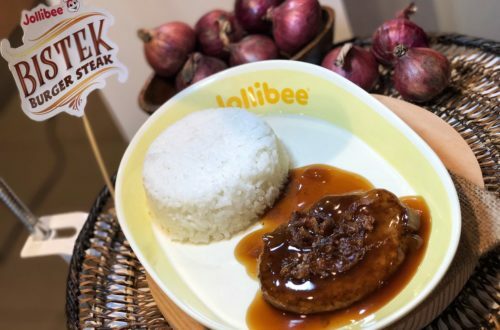 Since this favorite side dish makes a gastronomically glorious pair with a juicy and char-grilled burger that’s always in season, burger lovers shouldn’t miss this offer whole month of May. 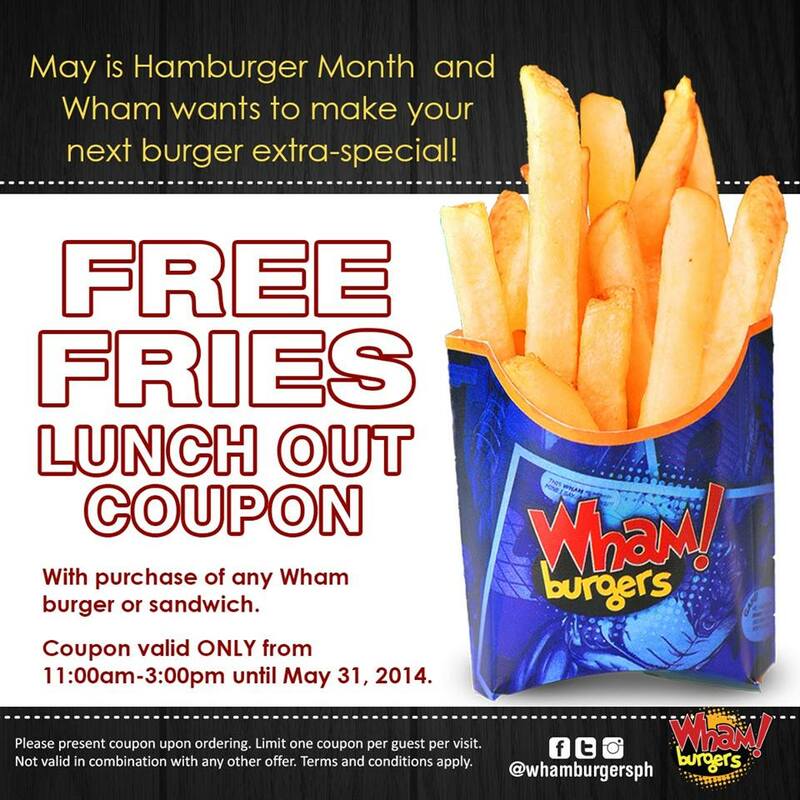 How to avail this special offer, just print out the Free Fries Lunch Out Coupon valid per single purchase receipt from the Wham! 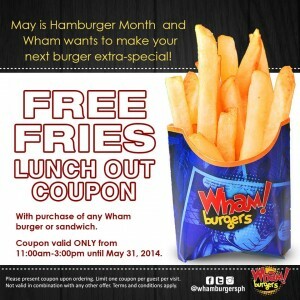 Burgers’ Facebook Fan Page and avail this promotion from 11 AM to 3 PM with a purchase of any burger. Enjoy every bite of your favorite burger are the variety of toppings and cheese choices as a savory addition, guaranteed to tweak the taste from something spicy, cheesy or tangy. With burgers and free fries supremely good as this, your lunch out surely calls for the companion of family and friends to fully enjoy Wham’s 100% char-grilled beef, the star in this filling and satisfying celebration. Visit Wham! 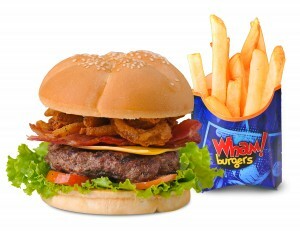 Burgers branches at Katipunan, SM North Edsa-The Block, and SM Mall of Asia. Check out their official website, like their Facebook page, follow them on Twitter and Instagram.